USDA Guaranteed Rural Housing Loans are designed to encourage rural land development and growth in rural areas. USDA Loans were long thought of as just for farmers, but the program has been expanded in recent years to help families without adequate home financing opportunities purchase a home in a rural area. 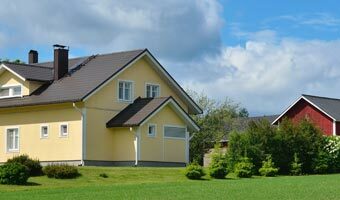 A USDA Guaranteed Rural Housing Loan is a 30 year mortgage, with an interest rate determined by the lender. No down payment is required (yes! ), which sets these loans apart from more traditional home loans. Applicants may have incomes up to 115% of the area's median income and must be able to afford mortgage payments, including insurance and applicable taxes. Credit score is also considered in the application process. Eligibility guidelines are very specific - but don't let that stop you from achieving your homeownership goals. An experienced USDA financing professional at Waterstone Mortgage will help you navigate through the USDA loan process and determine if you are eligible. USDA loans offer several unique benefits that set them apart from standard home loans. USDA loans require no down payment, so qualified individuals can finance up to 100% of the home's total purchase price. This makes them one of the more desirable loans available to homeowners.